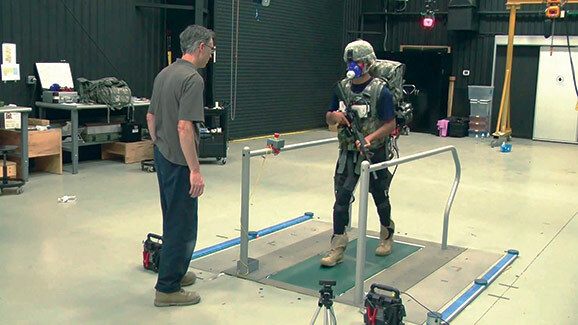 In previous issues of Soldier Mod, we have reported on the combined efforts of DARPA and Harvard University’s Wyss Institute to develop a functional powered exoskeleton. While they have yet to achieve anything close to the fictitious Iron Man, the project has taken a few major steps forward. In fact, the Wyss researchers concept is nothing like armour at all. That is because the purpose – for now anyway – of the exosuit is to lighten the soldier’s load, and increase his ability to traverse long distances, rather than offer ballistic protection, or weapons systems. As such, the latest incarnation of the suit is less like body armour and more like a tight pair of pants made up of crisscrossed webbing. These seatbelt-like strips align with the muscles and tendons of the wearer’s body. They sense the foot soldier’s movements and gives his or her muscles an extra “boost” whenever needed. This allows the wearer to run faster and carry heavier loads over longer distances without being fatigued. That may not be superhero level augmentation yet, but it is, in a word – amazing! The development of the soft exosuit is part of a first phase contract awarded to the Wyss Institute in 2014. The latest developments of the suit have made it lighter and more autonomous. Under the terms of the contract with DARPA, the Wyss Institute will receive up to $2.9 million for its work on Warrior Web, with full funding contingent on meeting a series of technical milestones. So far, the soft suit is meeting its stated objectives and is making great strides in achieving the goal of lightening the soldiers load. Is it too far of a stretch to imagine the same technology augmenting strength, agility and other combat skills in the near future?